"Many women have experienced horrific abuses within the power structures of our Christian world," Beth Moore, an evangelical teacher, wrote in a letter. At its annual meeting next week in Dallas, delegates called "messengers" will decide whether to approve a resolution acknowledging that, throughout the church's history, male leaders and members of the church "wronged women, abused women, silenced women, objectified women." "The #MeToo moment has come to American evangelicals," Albert Mohler, president of the flagship Southern Baptist Theological Seminary, wrote last month. "And I am called to deal with it as a Christian, as a minister of the Gospel, as a seminary and college president, and as a public leader." The convention is meeting in the wake of several widely publicized scandals in which prominent Southern Baptist leaders have been accused of or have admitted inappropriate behavior toward women. "Many women have experienced horrific abuses within the power structures of our Christian world," Beth Moore, a prominent evangelical teacher in Houston, wrote in an open letter last month. Most recently, the Southwestern Baptist Theological Seminary in nearby Fort Worth fired Paige Patterson, a pre-eminent figure in the denomination's conservative resurgence in recent decades, who had been its president since 2003. The seminary's board cited allegations that Patterson counseled a female student not to report that another student had raped her at a seminary he was leading in 2003 shortly before he took the Southwestern job. The board also said his history of remarks about women in general — for example, in a 2014 sermon he described telling a woman that her son's "ogling" of an attractive teenage girl was an appropriately "biblical" response — was "antithetical to the core values of our faith." Patterson's attorney accused the board of having "misrepresented" his client's actions in the 2003 case. In a statement, Patterson said, "I do not believe there is a woman or girl ever associated with me who would allege any abuse on my part" — an allegation that no one appears to have made. The Patterson revelations came on the heels of Frank Page's resignation in March as president and chief executive of the Southern Baptist Convention's executive committee over what the church described as a "morally inappropriate relationship in the recent past." Also in March, Andy Savage resigned as a teaching pastor at Highpoint Church, a nondenominational congregation attended by more than 2,000 worshipers every week at three campuses in the Memphis, Tennessee, area, after he acknowledged that he had been involved in an inappropriate "sexual incident" with an underage high school student 20 years ago as a youth minister at a large Southern Baptist church near Houston. Such episodes aren't surprises to women who have recounted their own experiences in the Southern Baptist Convention, which declares that they must "submit" to their husbands and doesn't allow them to be pastors or to teach men in any official capacity. On the second day of the annual meeting next week, a coalition of women — many of whom organizers say are Southern Baptists — plans to rally outside the hall to protest what they characterized as "the prevalence of abuse and its enablement within the Southern Baptist Convention." Cheryl Summers, one of the rally's organizers, said the demonstration would push for "reform of culture and for training of pastors and church leaders." "We follow Christ's example, who treated women with dignity and honor as equal, valuable members of his church when the culture of his day did not," she said. As the convention gathers against that backdrop to elect a new president, it will also consider the resolution to denounce sexual impropriety and abuse, as well as "anyone who would facilitate or knowingly cover up such acts." The resolution was written by Jason K. Allen, president of the Midwestern Baptist Theological Seminary, and it was signed by Steve Gaines, the convention's outgoing president; seven other former convention presidents; and both nominees for convention president during next week's election. It asks the convention to confess that throughout the church's history, men have "wronged women, abused women, silenced women, objectified women by ungodly comments and ungodly acts, preyed on women, left women unprotected, failed to report injustices and evils committed against women to civil authorities established by God and failed to act out of the overflow of the image of Christ." Patterson had been scheduled to deliver the keynote sermon at next week's gathering, a prospect that many Southern Baptists found distasteful. After weeks of calls for him to withdraw, he told the convention on Friday that he would step aside "to do what I can to contribute to harmony within the Southern Baptist Convention," the church said. Patterson remains a widely admired figure for having guided the church's sharp turn to more conservative theological principles in recent decades, which reached fruition when he was president of the convention during the late 1990s. Still, allowing him to speak would have sent "the wrong message," said Ed Stetzer, executive director of the Billy Graham Center for evangelical training and a professor at Wheaton College near Chicago, a leading evangelical institution. "I think the message that needs to come out of this Southern Baptist Convention is, we're sorry we didn't listen more," Stetzer said. "We need a different message, and that message needs a different messenger." Among the changes Patterson shaped was a revision of the convention's core statement of beliefs, the Baptist Faith and Message, which included a final declaration that "while both men and women are gifted for service in the church, the office of pastor is limited to men as qualified by Scripture." The policy is the extension of a Southern Baptist philosophy called complementarianism. On paper, it declares that men and women "are of equal worth before God, since both are created in God's image," while defining equal but separate "complementary" roles. In practice, the policy has reshaped the church according to the philosophy of the conservative men who launched a campaign to take over the Southern Baptist Convention 40 years ago. Rooted in the first chapter of Timothy, which says Jesus doesn't "allow a woman to teach or to have authority over a man," the doctrine institutionalized the man's role as the "servant leader" of the family, with his wife's submission seen as an act of grace. As a consequence, women have gradually but inexorably become second-class citizens within the church, according to many Southern Baptist thinkers, among them Moore, the Houston evangelical teacher whose Living Proof Ministries guides women who seek to model their lives on evangelical principles. "I have been a professing Evangelical for decades and, at least in my sliver of that world, a conservative one," Moore wrote last month in an open letter to her "Brothers in Christ," which landed like a bombshell among Southern Baptists as the Patterson scandal was emerging. The letter vividly detailed the challenges Moore faced as a woman who deeply believes in the Southern Baptist church and works to spread its teachings. Throughout her career, she wrote, "I was the elephant in the room with a skirt on." "I was the elephant in the room with a skirt on." Retelling a painful period when conservative Southern Baptist thinkers accused her of being a "false teacher," she wrote that she "inquired whether or not they'd researched any of my Bible studies to reach those conclusions over my doctrine, especially the studies in recent years." "The answer was no," she wrote. "Why? They refused to study what a woman had taught." Moore said she accepted the church's complementarian philosophies, pointing to the same chapter of Timothy that's behind the church's policy. But by 2016, she wrote, she had become fed up with the attitudes of key leaders that "smacked of misogyny, objectification and astonishing disesteem of women." Those attitudes are still growing, Moore said, with disastrous consequences for Southern Baptist women. "Being any part of shaping misogynistic attitudes, whether or not they result in criminal behaviors, is sinful and harmful and produces terrible fruit," she said. Mary Burbrink, a former student at Southwestern Bible Theological Seminary, said she was one of those women, and "for every one of me there are probably dozens more suffering in silence to afraid to speak up." In a letter last month to the seminary's trustees, Burbrink, a former Marine and corrections officer who entered the seminary in 2013, described working as a campus patrol officer to help pay for her classes. She wrote that her experiences as the "token woman" on the security team "sent me into a two-year struggle with depression and severe anxiety I have only recently began to work through." Burbrink told the trustees that she was ostracized because she is a woman and that supervisors refused to make accommodations in her schedule to allow her to teach preschoolers at a local church, accommodations she said were made for any of her male colleagues who asked. She said that she was never allowed to be alone with a man, even when she was on duty and in uniform. Burbrink quit the force in May 2016, staying on campus to continue her studies. But "I am a woman, so my gender and interpretations of the Bible were held against me," she said, describing chapel services at which women were told that they were "harlots" responsible for enticing men into sin. At the end of the year, Burbrink withdrew from the seminary and "stopped going to church for two years, stopped reading the Bible and praying, and was angry at God for putting me through what I felt was entirely unjust," she told the trustees. "It has taken me until as recently as January 2018 to even [be] able to set foot in a church again, due to my distrust of church, seminary, and denominational leaders," she wrote. The seminary said last month that it "denounces all abusive behavior, any behavior that enables abuse, any failure to protect the abused and any failure to safeguard those who are vulnerable to abuse." The seminary didn't immediately reply to a request for comment on the letter. Burbrink's words would sound familiar to Lesley Wexler, a law professor at the University of Illinois who, with two colleagues, is researching a paper for publication late this year or early next year examining how large institutions can reform to address the concerns of the #MeToo movement in ways that are fair to victims and perpetrators alike. "There do seem to be some problems in that churches often feel like, when they uncover a problem that is both a sin and a crime, the church often focuses on the sin part — individual repentance, individual forgiveness," Wexler said in an interview. "But sometimes, something can be both, and just because you want to handle it within the church doesn't mean it shouldn't be addressed in the legal system." To Wexler, one way to tackle the issue would be to "get rid of complementarianism entirely." But that is far more difficult than it sounds, she said. The draft thesis of the Illinois paper argues that "to change institutions, there must first be recognition that change is needed." 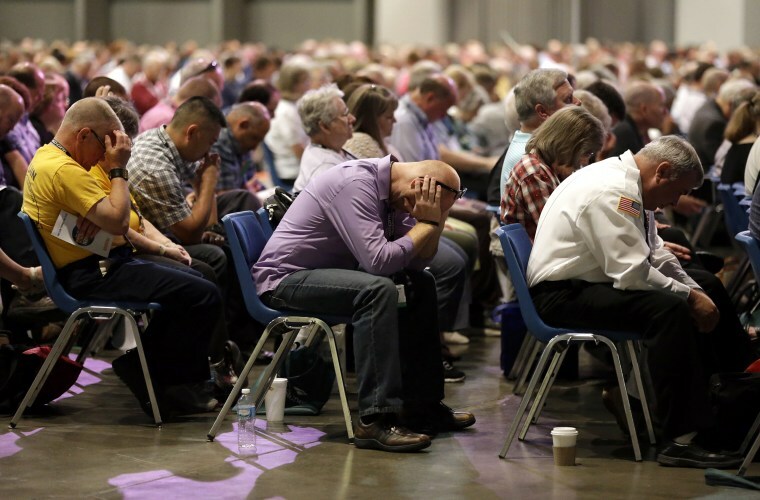 The problem for the Southern Baptist Convention, however, is that "there are some people who are just strongly resistant, just as there are people who are responsive to the #MeToo movement," Wexler said. Others, she said, "want to be responsive but are struggling with their assumptions." In any event, the policy isn't going anywhere, said Stetzer, the Wheaton scholar. That's partly because, as the convention's leadership has become more conservative over the last 40 years, forces that could resist have withdrawn to create their own denominations. Former President Jimmy Carter famously left the Southern Baptist Convention in 2000, citing its "increasingly rigid" doctrines in general and its ban on female pastors in particular, to join a congregation in the more liberal Cooperative Baptist Fellowship. Stetzer expects complementarianism to remain part of modern Southern Baptist philosophy. The problem isn't necessarily with the policy — the problem is when the policy "is mixed with misogyny," he said. "If the church founded by Jesus Christ is not the safest place [for women], we're doing it wrong," Stetzer said. Stetzer said statements like the sexual abuse resolution to be voted on next week illustrate that the church has learned a lot from the #MeToo movement — and that it can learn even more. "It has led to a reckoning in the Southern Baptist Convention," he said. "We're at a moment of reckoning, and I think Southern Baptists need to take a good, hard look at what is it in this movement" that speaks to people. At the same time, Stetzer said, the church's response could help to fuel the broader secular movement. "If the Southern Baptist Convention, as a large conservative denomination, can address some very real issues that have brought harm to women and survivors of abuse, that would be a good thing," he said. "It would bring hope to women even in hard places that change can come."